McCourt Construction has extensive experience working on both highways and busy urban streets. Since 2012 McCourt has built or is building 26 lane miles of new highway. In recent years we have built or widened 12 miles of Interstates in Massachusetts all under scheduling restraints that did not permit lane closures between 6:00 and 10:00 AM or 2:00 and 6:00 PM. In addition to widening, McCourt’s recent experience working on, over, under or alongside highways includes building new bridges, erecting temporary bridges, building or rebuilding tunnels, reconstructing interchanges, extending culverts under highways, building new cast-in-place, MSE, and EPS retaining walls, erecting several miles of noise barriers, installing new traffic cameras, relocating utilities, and recreating wetlands. For an example McCourt Construction’s highway experience, please see our project page for the Route 128/I-95 Project. In addition to highway work, McCourt is intimately familiar with the challenges of working on busy urban streets. 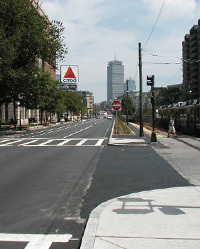 In recent years McCourt has completed city streets projects ranging from a $22M reconstruction of Commonwealth Avenue in Boston, to a $13M rebuild of 15 congested intersections in Dorchester, to a $9M redesign of a busy street through M.I.T.’s campus. We pride ourselves on our ability to maintain clean, safe work zones in heavily trafficked urban areas. For an example McCourt Construction’s city streets experience, please see our project page for the Commonwealth Ave Improvement Project.